Oh me. I just love this one. Y’all go out there and have yourselves a StuART kind of day, OK? 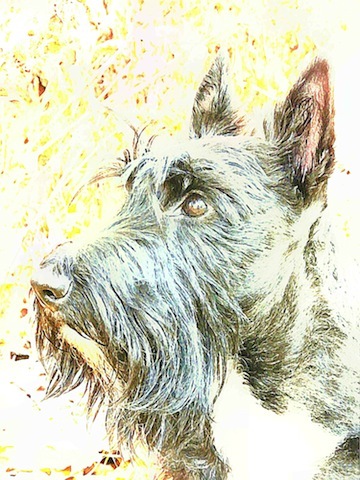 This entry was posted in Scottish Terriers, Terriers, The Scottie Chronicles and tagged art, dogs, paintings, Scottie dogs, Scotties. Bookmark the permalink. We love this one too, you handsome Scot! How can you improve on prefection. Beautiful picture of a very handsome scottie!! You’ve gotten Elsa all excited – how handsome you are! Nice profile! You were meant to be in watercolors, Stuart. This is one of the best StuArts. You are a handsome devil. Dat are some pawsome StuART. Wow – that’s fantastic!! You handsome devil, you!